Russian Forces Reportedly Seized 3 Ukrainian Warships, Which Illegally Entered Its Waters Off Crimea (DEVELOPING) 5 out of 5 based on 14 ratings. 14 user reviews. UPDATE 4: The Ukrainian Navy updated its version of the events. The fresh report says that the small armoured gunboat Berdyansk and the estuary tug Yani Kapu under control of Russian forces and are being towed while the small armoured gunboat Nikopol has been blocked and is being escorted by Russian forces. The direction of their movement is unclear. If the Ukrainian Navy version is confirmed, the warships retreating to Berdyansk, according to the Russian side, are two Gurza-class small armored artillery boats. UPDATE 3: the Russian Federal Security Service says that some Ukrainian warships are now returning to their base in the Ukrainain port of Berdyansk. The Federal Security Service added that it has hard evidence confirming that the Ukrainian side had intentionally prepared this provocation in the Black Sea. The situation with the operation to “seize” three Ukrainian warships reported by the Ukrainian Navy remains unclear. Some sources speculate that polite Russian servicemen just adviced Ukrainian sailors that it’s time to return to their base from Russia’s territorial waters. Some observers point out that Ukrainian warships returning to Berdyansk are those two Gurza-class small armored artillery boats, which were sent to the area close to the incident by the Ukrainian Navy in the course of the encounter. UPDATE 2: The Ukrainian Navy confirmed social media speculations that small armoured gunboats Nikopol and Berdyansk and the estuary tug Yani Kapu were captured by the Russian Federal Security Service’s Border Service in waters off Crimea. According to the Ukrainian Navy, 2 of its servicemen were injured and the gunboats were immobilized by fire from Russian forces. The warships illegally entered Russian waters off Crimea in the morning of November 25. Since then, the Russian side has been attempting to solve the situation peacefully. However, by the evening hostile actions of the Ukrainian side have forced the Federal Security Service’s Border Service in Crimea to employ direct actions to put an end to the violations. UPDATE 1: According to speculations in social media, the 3 Ukrainian warships were captured with their sailors by the Russian Federal Security Service’s Border Service following a short encounter. A few moments ago, the Ukrainian Navy claimed that its “naval group” had come under fire from the Russian Federal Security Service’s Border Service in waters off Crimea. According to the report, the small armoured gunboat Berdyansk was damaged and became immobilized. The Ukrainian Navy further alleged that one of its serviceman was injured. Unconfirmed media and social media reports say that the Berdyansk itself is about to be seized by Russian forces. Earlier on November 25, the small armoured gunboats Nikopol and Berdyansk as well as the estuary tug Yani Kapu illegally entered Russia’s territorial waters in the Black Sea. The formal purpose is that they were allegedly heading to the Ukrainian port of Mariupol in the Azov Sea. This naval group was intercepted by the Federal Security Service’s Border Service in Crimea and stopped in the area south of the Kerch Strait. Then, Ukraine sent two Gurza-class small armored artillery boats towards the area of the incident. However, they stopped outside Russia’s territorial water. sink that nazi assholes. game over. ‘The hammering of the match will not be a soccer game.’? Think Google translate might have got it wrong, judging by BMWA1s reply. Almost. Antun Vrdoljak, Renowned Croatian film director and later Minister of culture in a Croatian Government, made film about WWII in which in a scene one of partisan commanders asks his adversary after he surrounded: “Why you didn’t surrender?” “The war is not a football game” replies young “Domobran” (conscript in Hitler’s puppet state of NDH). While “Čačkanje mečke vo piždže” is a joke well known in former Yugoslavia and it is in kind of broken Macedonian (FRYOM language). Basically, it means” you better not mess with she-bear reproductive organs. “The Pine Tree in the Mountain” is not correct interpretation of the film title, It ti more like “green Pine Grows in the Mountain”… anyway, to me it is one of the best films about resistance movement against German invaders and quisling formations in former Yugoslavia. Thanks for the explanation, plus, the link. I wonder what the ukrainians been promised to go on a suicidal run. That’s right. A response testing exercise as told to do by their masters. Those cookies might have been cheap then but they were laced with everlasting stupidity mixed with enslavement. Throw off the shackles of the Bear and become our slaves forver. very much what the greeks are doing today in their majority. But I guess humans deserve the leaders they vote for. (well worth reading, from the same crowd who sold us the Iraq War, based on lies). Yes, I read that this morning and interestingly was at a funeral recently where a member of the deceaseds family who has had a mid ranking career in the UK Foreign Office, Saudi Arabia, UK Foreign Office and now is a De Facto lobbyist for a Think Tank that seeks to influence Government opinions. It appears that a group of pals from an Echo Chamber dream up policy wish lists. US insane warmongers are probing Russian response to violations of Russian territory and trying to encircle it with NATO military of faggots. Never bait the bear as it will bite their heads off. The Uki hohols are total morons and will sell their mothers for $10 and they do. The US scum and Zionist parasites have infected Ukraine and it is time to fumigate them. Don’t think fumigation will help when zio terrorist jews are involved…only roasting what’s left….FIRE UP THE OVENS…..
Next instalment of money to go into poroschenko’s pockets! You know food out of the mouths of his people. They see NATO training drills happening in Ukraine and assume that they’ll receive military assistance because of the anti-Russian stance of US msm and politicians. They don’t understand the nature of political propaganda. It’s all for show. Russia will arm Iran to the teeth if the stupid AmeriKKKans think Russia is alone. China is also a US target and getting closer to Russia by the day as it faces similar US threats. Although i laughed and would love this to be true i don’t believe it. Surely they would all be charged for dereliction of duty and going Awol. You were joking right? As Norway Navy and USN found, tankers are deadly, the modern fire ship. Those three returning to base were approaching from the Sea of Azov side. The three heaps of junk approaching from the South attempting to pass into the Sea of Azov are the boats and crews that have been detained. Read the comment by ‘Intel Drop’ over on the other South Front article, concerning Russia-Ukraine Black Sea. Goes with what you say, with reason behind it. Seriously interesting, if true. Love the way they have closed ship access to the bridge. Simple, but, effective. That was the original wording of Update 3. Rumored that the 3 are being towed to Kerch. Hope those stupid zio slaves learn that when u poke a big bear too much…. I did read elsewhere that Russian ships have barricaded the entrance to Sea of Azov just as your photo shows. The Ukranians have got to be some kind of stupid to line up to die in provocations on behalf of the US empire-of-chaos … do they honestly think they will be remembered as heros who stood up to the Russian Bear? … No, they will be remembered as a particularly dumb kind of stupid. If all this gets too far out of hand, there will be nobody left to remember them. The 3 Ukraine ships were so old & rusted even the Russians realised it was not worth wasting munitions sinking them!! Ukraine is historical part of Russia and the US criminals and warmongers are creating problems there with a puppet Porky regime. Russia needs to incorporate Ukraine back in the motherland and the majority of Ukrainians are fed up with US and Zionist agenda. Historical facts are that the ignorant West must understand that, to Russia, Ukraine can never be just a foreign country. Russian history began in what was called Kievan-Rus. The Russian religion spread from there. Ukraine has been part of Russia for centuries and always will be, and their histories were intertwined before then. Some of the most important battles for Russian freedom and nationhood, starting with the Battle of Poltava in 1709 , were fought on Ukrainian soil. The Black Sea Fleet — Russia’s means of projecting power in the Mediterranean — is based by long-term lease in Sevastopol, in Russian Crimea. Even such famed dissidents as Aleksandr Solzhenitsyn and Joseph Brodsky insisted that Ukraine was an integral part of Russian history and, indeed, of Russia. The great Russian people and their Soviet allies defeated the Nazis in Ukraine and will defeat the Zionists and neo-Nazis there again too. All true, but the US would use any Russian action to get their European sycophants to isolate Russia, and buy American controlled oil and gas. This is war, just like the US/UK started WWII long before the shooting started, we are again in the same position, that is the US needs a war to get out of debt. The Ukrainians will have to suffer under the American jackboot for a bit longer if the US/UK are to be defeated. “what was called Kievan-Rus” actually it was called just Rus (no Kievan at all!) – Kiev, Novgorod, Vladimir, it was all Rus(sia). Then in 19th century russian historians created that name “kievan Rus” to refer to the period when the centre was in Kiev. Pure historiography, without any political (or ethnic) connotation. More stupid to come I think. 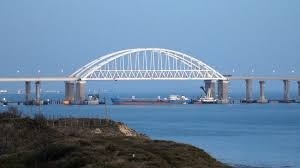 So anymore on the rumor that the tug was a bomb, designed to destroy the Kerch bridge? More likely Porky is trying to make waves. What about the two ships incapacitated by russian fire! Missiles? Torpedoes? What did it and why could n’t ukis fire back? They never react with force and have never blockaded the Sea of Azov. ASM and Torpedos were waiting. should bomb the Crimean Bridge). So did the Ukro tugboat sailors know that they were carrying a nuclear bomb? Did they honestly expect to send five warships and Russia would not notice them or see that they were unloading an underwater bomb? No one is going to use nuclear weapons willy nilly like that. Of course the story is being scrubbed. Its beyond ridicolous. That’s right and no matter how small a nuclear bomb is it is going to leave a massive radiation footprint. As if Britain is going to give Ukraine a nuclear bomb with their fingerprints all over it. I think someone should write a book for the fantasy fiction section. US and Britain don’t need to use a nuclear bomb by Ukraine to start a war with Russia. They have multiple prodding points to choose from. Both sides need to negotiate in this region so that both forces can be diverted south to fight ISIS and other headchoppers. Since both sides respect abortion rights, there is no issue near Ukraine worth fighting over.